If your data centre is fitted with a ceiling plenum, using the hot air return system might be the best option for you to duct the air back to the air-handling units. Using this system, like cold aisle containment, separates the hot and cold air, eliminating air recirculation in the aisle. Our design is a non intrusive and easy to fit solution which provides data centre managers with the ability to re-organise and expand facilities in line with business requirements. Similar benefits accrue from hot air containment as for cold air containment. 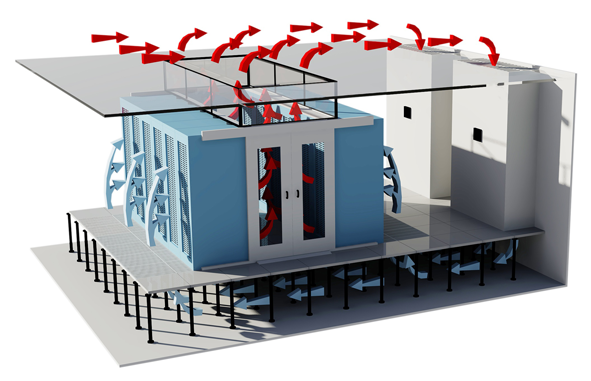 In fact hot air containment can be even more efficient than cold air containment, but with some loss of flexibility. All Keyzone systems are designed to maximise the performance, uptime and life expectancy of your IT equipment whilst reducing operating costs.